Tall muscle guys like actor Conan Stevens (left) are the biggest of Big Don's Boys! Look how he towers over those Asians. He's 7'0" and sometimes up to 330 lbs. Trouble is it's hard to get buff when you are tall. It's easier to build a scale model than it is to build the real thing. Bummer! The time spent just eating is unbelievable. Also, buying toilet paper. Most bodybuilders are very short. It's a good way to get attention and make people come to you. I remember the first time I saw Lou Ferrigno at Gold's Gym in Venice, CA. I am 6'2"-6'3" and he was shorter than me! I couldn't believe that I was taller than the two most famous bodybuilders of my childhood. 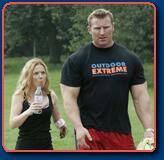 Well, Arnold Schwarzenegger and Lou's height have been greatly exaggerated although they are plenty tall. People do slowly shrink as they age but, at this time, Lou is barely 6'1" or 6'2" and Arnold perhaps 5'11"-6'10". Arnold is not even tall enough to be one of Big Don's Boys! Hopefully his career will survive. Bodybuilders also show up a lot in the Strength section and sometimes the Fighters area. Lots of big pro-wrestlers out there. I've been a little more generous in this gallery concerning who is allowed in. Some of these guys are hardly the size of 1977 Arnold (though neither is Arnie. He has been busy running California, the world's seventh largest economy). But I included leaner men if they were flexing, posing and showing off. It's the attitude that matters (see also Adorable). Although there are some pictures of guys in muscle competitions there are also lots of photos of bodybuilders working out, on vacation or just plain clowning around. At 6'7" (2.01M) Aaron Reed is one of the tallest bodybuilders in the world. It also doesn't hurt that he is very handsome and ripped all the time! He recently sent me some great new photos with a couple different haircut/looks. I'll be adding them to his gallery right here. Tall bodybuilders have it very tough as they have to eat an incredible amount of the extra food that short muscle guys don't. And a lot of tall men are like me, naturally lanky, and we just don't put on weight that easily. I fidget the pounds away nervously all day. You just don't see basketball players with V shaped backs because wide guys don't jump as high. Aaron is so tall that, even at a massive almost 300 lbs. he still manages to look elegant and aesthetic. He is a seven time National Physique Committee contest champ. No wonder! 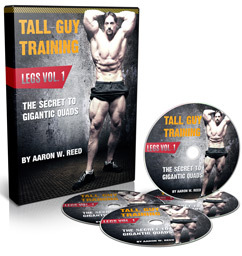 Recently Aaron has put together a series of training books and DVDs especially for tall guys wanting to gain muscle. I can't tell you how many times people have emailed me at my site or on my Youtube channel asking about training tips for tall guys. Now I finally have somebody to direct them to. I'm sure nobody else knows as much about competitive bodybuilding in the tall category as Aaron does. Originally he was not that interested in becoming super huge because he was concerend it would turn of the girls. Well some women are intimidated or turned off, but he told me that he's getting enough attention that there "are always more out there!" Yeah I can believe it when you look like that and meet one bodybuilder loving babester after another in the gym or at a contest. One problem is that he is too big for competitions. Don't tell that to somebody who is reverse anorexic! "They told me the biggest I could be is 270lbs for my height in the classic division at Nationals in Miami (Which is the tallest class), so I am going to cut to get under that. Even though I don't really want to. But it is my best chance to get a PRO card. 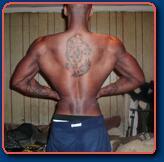 They are not ready for a bodybuilder my height as their champ in regular bodybuilding just yet. The good news is, i can cross over after I turn pro if they dont allow me to compete at a heavier weight in the classic division. " Every few months I get calls or emails from casting directors looking for really really tall guys especially bodybuilders and chunky, tattooed scary guys. Tall men always have to play the villain. Hopefully I can help Aaron get cast in something where he plays the gorgeous jerk, the killer cyborg, or the kind of the surfers. You know, one of the golden boy roles. 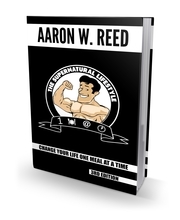 NUTRITION HINTS: 6'7" Mormon bodybuilder Chris "Zeus" Rueckert and bodybuilder the "Ripped Chef" demonstrate how to cook eggs without getting armpit hair in the food. JUST KIDDING! Chris is an unbelievably handsome 265 lb Nationally qualified Physique Competitor. He works for a Mormon facility that helps people get off drugs and alcohol and his dedication to the clean cut Mormon lifestyle is obvious. Together these supermen show how they cook themselves super-low bodyfat diets. Either one of them could win a bodybuilding contest tomorrow. Plus the stovetop area is lovely. I wish I lived there!